2007 Kern Electronics & Lasers Inc. “Kern Laser System” mdl. 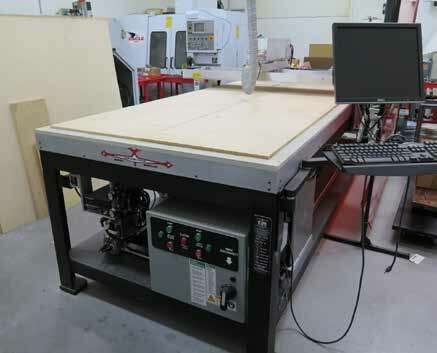 KER52100-G150 CNC Wood and Plastics Laser Cutter and Engraver s/n KERGB33737 w/ Windows Based Controls, AutoCAD LT and Corel Draw Software, 150 Watt Laser, 48” x 96” Table, Only used once (Metal Cutting Attachment Available thru Manufacturer). 1997 Yang SMV-600CNC Vertical Machining Center s/n Z00157 w/ Mitsubishi Controls, 16-Station ATC, CAT-40 Taper Spindle, Hand Wheel, Chip Conveyor, Coolant. 1997 Yang “Eagle 12” SML-12 CNC Cross Slide Turning Center s/n C00177 w/ Mitsubishi Controls, 7 5/8” x 15” Cross Slide Table, 6 ½” 3-Jaw Power Chuck, 16C Collet Nose, 5C Collet Nose, Chip Conveyor, Coolant. Mitsubishi ED-2000M EDM Small Hole Drill s/n 100 4-1146 w/ Mitsubishi PLC Controls, 8” x 12” Work Area. Autobag mdl. AB180 Automatic Bagging System w/ Accu-Scale mdl. AS-220 Scale System, Autobag mdl. Flow Controller, Ingersoll Rand “Dry Star” Refrigerated Air Dryer. 2007 Vibra Finish “Vibra Hone” Vibratory Polishing Machine. C&M Topline “Mr. Deburr” mdl. 300 Media Tumbler. Darex mdl. XT 3000 Expandable Tool Sharpening System w/ Acces. Speedaire mdl. 5F231B 5Hp Vertical Air Compressor s/n L5/31/97-01152 w/ 80 Gallon Tank. Hobart Beta-MIG 251 MIG Welding Power Source s/n 296WS12623. (2)Jergens Quick Change 6” Double-Lock Vises. 16C and 5C Collets.Insert Milling, Turning, Boring and Drilling Tools w/ Carbide Inserts. (8)Huot Drill and Tap Cabinets w/ Custom Tooling Cart. Drills, Taps, Reamers, Carbide and HS Endmills. Kennedy / Bott 11-Drawer Tooling Cabinet. Kennedy / Bott 6-Drawer Tooling Cabinet. Kennedy 8-Drawer Roll-A-Way and 5-Drawer Top Box. Craftsman 6-Drawer Roll-A-Way Tool Box. 8-Drawer and 4-Drawer Tooling Carts. 2007 Amsec Amvault High Security Safe. Lincoln SP-175T Arc Welding Power Source s/n U1011114215 w/ Cart. Delta X5 13 ½” Vertical Band Saw. Rockwell mdl. 43-120 Spindle Shaper s/n LJ6968. Jet mdl. EHVS-80 6” Horizontal / Vertical Edge Sander s/n 1043339 w/ Stand. Delta Type 1 “Shopmaster” Bench Model Wood Lathe. Jet mdl. AFS-1500 Air Filtration System. Nissan mdl. MPL01A15LV 2500 Lb Cap LPG Forklift s/n PL01-9G0923 w/ 3-Stage Mast, 187”” Lift Height, Side Shift, Yard Tires, 147 Metered Hours. Ceiling Mounted ½ Ton Electric Hoist w/ Trolley and Rail. Shop Carts, Tables and Cabinets. KIP mdl. KIP3000 36” Wide Format Copier / Printer. Bren mdl. 626 Pro Series Cutter. HP DraftMaster II 36” Wide Format Plotter. GBC Heat Seal H525 Laminator. Metler Toledo Xpress 30 lb Cap Digital Counting Scale. Packaging Boxes, Foam Filler and Misc Supplies.